Adolf Hitler was on the verge of creating an Orwellian-style cable TV system to broadcast Nazi propaganda around Germany. Screens would have been set up in public places, including in laundries so housewives could tune in, according to a documentary based on papers and tapes found in his bunker. When the Allies overran Germany, engineers were on the point of a technological breakthrough to allow TV pictures to be transmitted to screens and sound to radio receivers. They had also recorded programmes on news, sport and education. Prototype programmes included Family Chronicles: An Evening With Hans And Gelli, an early reality TV show depicting the wholesome Aryan life of a young German couple for the rest of the population to model themselves on. Another plan was to show footage of executions of traitors to the Nazis. The plans first came to light in 1945, when boxes with tapes were found in the ruins of Berlin by Soviet soldiers, the Russian documentary says. According to the programme, the engineer Walter Bruch was asked to make 'people's television' a reality. He tabled a document to Hitler called 'Plan to supply people's transmitter to German homes,' and the laying of a broadband cable between Berlin and Nuremberg was begun, it claimed. A former SS officer, Curt Schulmeitser, told the programme how a relative of Hitler's mistress Eva Braun was filmed being shot after being caught trying to flee Berlin as the Soviet army advanced. 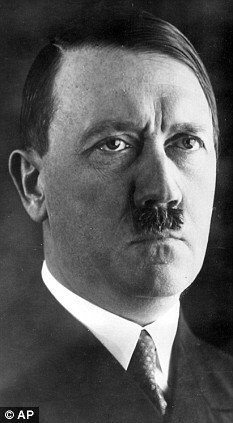 Schulmeitser said Hitler's deputy Heinrich Himmler authorised the filming and hinted it was being filmed for Hitler to watch. Josef Hebbels, who masterminded the plan, told Rudolph Hess's sister Margaret, who was also working on the scheme: 'We'll be able to show whatever we want. We'll create a reality, which the people of Germany need and can copy. Your task is to teach German women to live this way'. Hitler early on realised the power of television propaganda. His address at the opening ceremony of the Berlin Olympic Games in 1936 was broadcast to system of bulky mobile TV stations where Germans could watch in town squares. But the programme claims the Nazi leader and his scientists were planning a far more complex series of public TV screens before the allies overran Germany and he committed suicide in 1945. 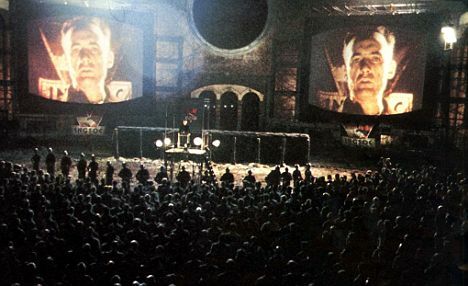 The scheme is reminiscent of George Orwell's novel 1984, where Big Brother looms out from public screens entreating the subdued populace to work for the state and telling them 'Big Brother is watching you'. The reality television show, Big Brother, in which contestants are under constant surveillance, is based on Orwell's concept.